Unless noted or pictured, power cords or adapters are not included. No other accessories are included in this sale. Used - Tested & Working. Pulled from a good working PC, this unit was gently used. The bearings on the fan are still quiet and smooth. Series : EarthWatts Green. Energy-Efficient : 80 PLUS BRONZE Certified. Maximum Power : 380W Continuous power. Series: Earthwatts. Output: 380W. Compliance: 80 PLUS. Condition: NEW. Item Details. 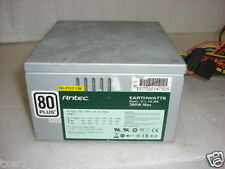 Antec Earthwatts EA-380 380W Continuous Power ATX12V v2.2 Power Supply. Condition is New. Shipped with USPS Priority Mail. This lot is used and working. Only the cords/cables displayed in the pictures are included. No power cord included. There are scratches, scuffs, slight dents and other signs of wear due to previous use and handling. Straight through fan pulls air from the drive bay instead of the hot motherboard area. Factory warranty until 12/25/2018 (if it is transferable). No case screws or power cord. 1 x power 24 pin ATX with detachable 4 pin section. Input Power Range: 100-127V / 200-240V. Line Frequency: 50 - 60Hz. Manufacturer: Antec. Output : 380 Watts. Before we list an item we power test it if it requires power, if it is a motherboard we test it while in the system before dismantling, if it is a peripheral device that we can test on or in a system we do. Manufacturer: Antec. Includes, Universal Input, Active Power Factor Correction (PFC). With its independently certified 80 Plus BRONZE design, the Antec’s EarthWatts EA-380D will do all that and more. Get more power and lower your electric bill with the new EarthWatts Green series! Picturesare of the actual item for sale. Technical Information NurTech Technology, LLC, was established in 2006. We are a team of experts who are flexible, attentive, and responsive. Hours of Operations: Mon- Fri 10AM to 5PM EST. Our Warranty Policy. Manufacturer: Antec. Category: Power Supplies / Power Protection. QA Certified! »Hard Drives. MPN: EA-380. Part Num: EA-380. New in open box (UPC symbol has been cut off of box), never used. Tested Working. THIS IS PULLED IN WORKING CONDITION. MAY HAVE WEAR FROM AGE OR USE. Earthwatts Model: EA-380. 80 PLUS 380W MAX. Morgan Hill, CA 95037. Do you need a lift gate truck for your drop off location?. Can't find the answer you're looking for?. CRT glass, except for glass with lead content less than 5 parts per million, and clean of phosphor, CRT fines, coatings and frit. Manufacturer: Antec, Inc. Plug/Connector: On/Off Switch. Green Compliance Certificate/Authority: 80 Plus Bronze. Power Factor Correction (PFC): Active. Although quite a number of manufacturer have adopted the 100-240v (autovolt) power, still a large number of electronics devices may still be mainly 110v. 100% Tested Working. Grade "A". Grade A: Fully Tested. Item is in GREAT condition. If an accessory is not shown in the photos it is not included in what you will receive. We do our best to fully describe the condition of each item. Condition:Used tested good. Credit Cards Accepted. Tested working GUC 12/30 WH. Green Penguin Inc. we are here to assist. Good condition. DC display not included. 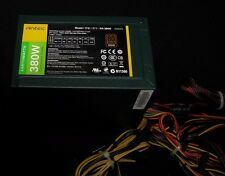 Antec Model / Part Number:EA-380D Green. 1 x 20 4-Pin ATX Connector. 2 x 4-Pin ATX Connector. 6 x SATA Connectors. s (Subject to Clearance). Rest of the World. We will try to be both accurate and as fast as we can be. Condition: This is a "new other" item. Item has not been used or installed. Item is mint and complete. Location:shelf 11 b 3. Hawaii, and Alaska. 3x Antec EarthWatts 380W ATX (EA-380D). Used and tested. Few scratches. DONATED ITEM - The item is in good condition but may need cleaning. May be useful for parts, repair, or a prop. We are not the original owners and cannot warrant collectible condition. You are buying the item pictured as-is.